The students at the Indian Institute of Technology (IIT)-Bombay have provided India its first green car that can be used on the racing track. 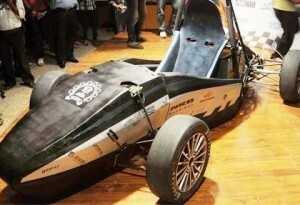 The country’s first electric race car, Evo1, designed and manufactured by the IIT-B Racing Team was launched on June 14. The car, the first such creation at the student level, will be put to the test in the Formula Students competition at the famous Silverstone Circuit, UK, in July. The competition is a testing ground for the next generation of world-class engineers and it challenges university students from around the world to design and build a single-seat racing car. The single-seater Evo1 has been created by a team of 60 students from different disciplines of engineering. According to Prateek Sharma, a member of the IIT-B Racing Team, the cost of the car is around Rs15 lakh, which is Rs3 lakh more than what a car with traditional motor engines and which offers similar efficiency would cost. The car is powered by high-efficiency direct current motors and superior lithium polymer batteries. It has no tailpipe emissions, thus leaving a negligible carbon footprint. It also has a comprehensive data acquisition system, which collects and transmits data of important parameters of the car such as the amount of charge left in the battery and its temperature, motor current, number of revolutions per minute of the wheel and vehicle acceleration.